When I first started gardening I was all "plants plants plants." Completely insane with plants. I overdosed many times a day. I have the medical records to prove it. Obviously, gardeners eventually garden just as much for the plants and themselves as for wildlife. Having insects and animals in the garden extends it into a new physical dimension, a "Z" axis if you will (remember your high school algebra?). Sculptural plants that were kinetic only in the wind are now kinetic as they play a part in the lives of other organisms. Of course, we don't see the vast majority of these organisms, but the ones we do see give this gardener quite a high--especially in winter--and a deeper, more lush and meaningful high than just plants plants plants. This last week or so a red-tailed hawk has been buzzing the yard. Two days ago in high north winds the hawk was floating above the garden, hovering like a helicopter, hopefully at work on clearing me of my rabbit problem (nota bene: I've not seen a rabbit in quite some time--but maybe the snow melt has something to do with this as other food sources open up). But the hawk was gone before I could move to get the camera. Later that day I was sitting on the couch grading student blank verse poems. I saw the hawk crest the tree line 200 feet away. I knew it'd simply pass over the house as it always does. It flew quick and low and out of sight. After 10 seconds I made myself grab my camera, debating the possibility of getting a shot if it came around again. It flew by probably no more than 30' off the ground, but I knew it was long gone. Standing at the sliding glass door there it was, perched like a giant football atop a neighbor's eastern red cedar. I couldn't believe it was balanced there. It reminded me of a Christmas tree angel hung off to the side because, if placed on the very top, the tree would bend over. I missed the shot. 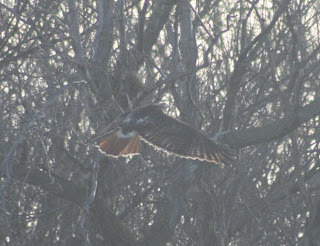 As soon as I snapped off my SLR cover the hawk was leaping into flight. Below is what I got. In the dead of winter I get the fullest, bare-bone understanding of where I am, and how I and my garden and little 1/4 acre homestead are connected to the larger world. A hawk passes over my yard in a second. In one minute how much more has it experienced than me? Whose perspective is deeper and richer? Whose life would suffer more for the lack of the other? The answer to that last question should be obvious. great post - we've been spying on an eagle and 2 fox through our telescope, too far off to photograph with my camera. I like your questions about one time photographic experiences. My father spent his career as a research biologist and has always been a passionate birder. He also introduced me to photography, although he is a 'collector'; each specimen is dead center, not always in focus, etc.. I mostly have photographs of him photographing birds. I do like to have my camera with me and photograph lots of things, but I"m not collecting subjects. I find that when I'm in a place that I know really well I can get more out of the image because I can really understand what's interesting about it - no matter the subject. But when I'm in an unfamiliar territory, everything is interesting and I have no ability to sort through it all. It's the equivalent of visiting another country and spending hours photographing toothpaste at the pharmacy. I have never understood why someone would prefer to record an event on film rather than experience it viscerally. I would rather allow that experiences to carve itself into my brain and flow through my veins. Later, when the moment has passed, I cannot be certain that I will ever have the time to revert to the digital memories to relive the event. However, I do know that my mind and body will never forget that experience. I think that the act of taking photos is an act of appreciation rather than ownership or appropriation. A different perspective, surely? Yes. I remember that great blue heron photo I missed. It lingered in my mind, evoking mystery, a glimpse of a god in ancient times--all in all a much richer experience and more meaningful that a bare picture. Unless, of course, the photo becomes a work of art, and other mental processes come into play. I know what you mean about taking a photo of something seeming to diminish the experience a little. I've long felt that, which may explain I have so few photos from trips I've taken, or family. Still, it seems to diminish only in that moment. Later, much later, years later, I find old photos that I *have* taken and it all comes rushing back. So, it is a gentle conundrum. I often feel as if I should leave the camera at home when I go on an adventure. So that I could really see and experience the place, rather than what it is seen through a view finder. Sometimes with photography your memories of a place become your memories of a photograph and not the thing. But like Susan says they are so valuable later on, especially in this age of sensory overload. Love this blog. Gorgeous shots. I was just googling (why does that come up red in this day and age!) 'swallowtail'. Hope to keep visiting! JP--Toothpaste at a pharmacy--that is EXACTLY what it's like. It's so easy to get caught up in and capture the emotional responses to such a new environment. Yes. AB--Maybe your mind and body will never forget, but I find the older I get the more I need a trigger, and it has to be physical, sensorial. Layanee--Yes, different. I still contend it's an act of ownership, double ownership if you created the photographed item. James--What makes a work of art? Isn't it personal interpretation? Why must it be art? Susan--You put it well, gentle conundrum indeed. Les--So true. But I wonder without the photo--even if it does become our experience--do we lose all experience? Twelve years ago March I stood in my kitchen on a Thursday morning trying to come up with a good reason to call in sick. Instead, I finally headed out for a chilly morning walk to work. I lived in Atlanta then, and would pass from the traffic into Piedmont Park. As I passed through, I watched the homeless get out of their covers, stretch, the steam coming off their bodies, then snuggle back into the blanket pile. I heard squirrels chattering and turned to see a red tail hawk, no more than 10 feet away, just miss one squirrel. It was a good day, at least until 5:30 that afternoon. But that's another story, and that hawk made the next year and a half okay. Anon--What a wonderful little story, except for their being homeless, and what happened at 5:30. It amazes me how such a small thing inteh natural world lingers in us, and perhaps it does precisely because we an attache meaning to it, make metaphorical. I'd trade anything to be a hawk for a day, but I wouldn't trade everything not to be human and to feel pain and joy at once. Robert Bly says something like, the first time we see a tree and realize it doesn't need us, has it's own life, we are sad and upset. The second time we see the tree and think this, we ae joyful and at peace. Hi Benjamin, this is such a great post. I am fascinated with how you deeply appreciate and even connect with what is around you. For me,I don't think there is ownership on the objects or events we value, nothing is ours here. We only share with others. That's probably the underside value of taking photographs, like seizing the moment or experience so we can share with others which makes it more meaningful. You saw a hawk? Well, we have a bobcat in our neighborhood!